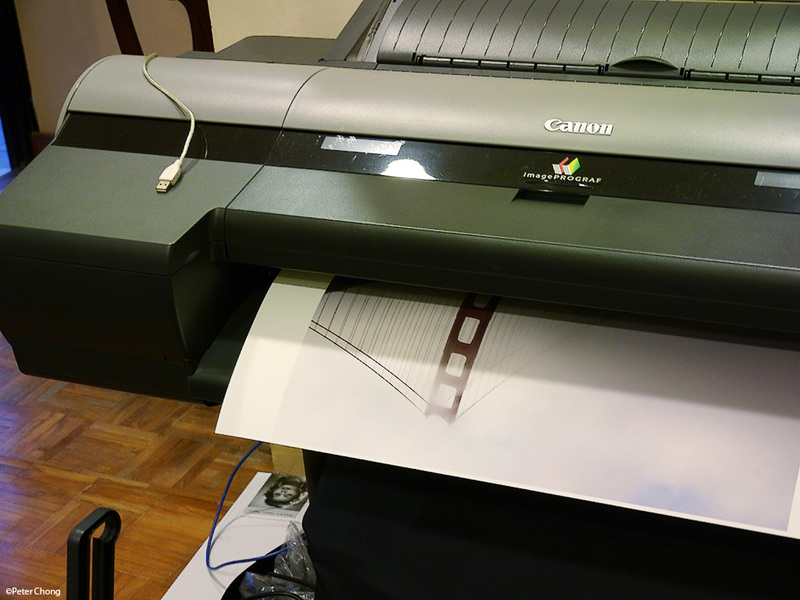 Continuing on my Canon ipF6350 review. This installment, I show how to change the roll paper. The printer came without the instruction manual...though if you buy one, you will get the 110 page manual. I haven't seen it so cannot comment. But I have found changing a roll of paper to be very intuitive and easy. 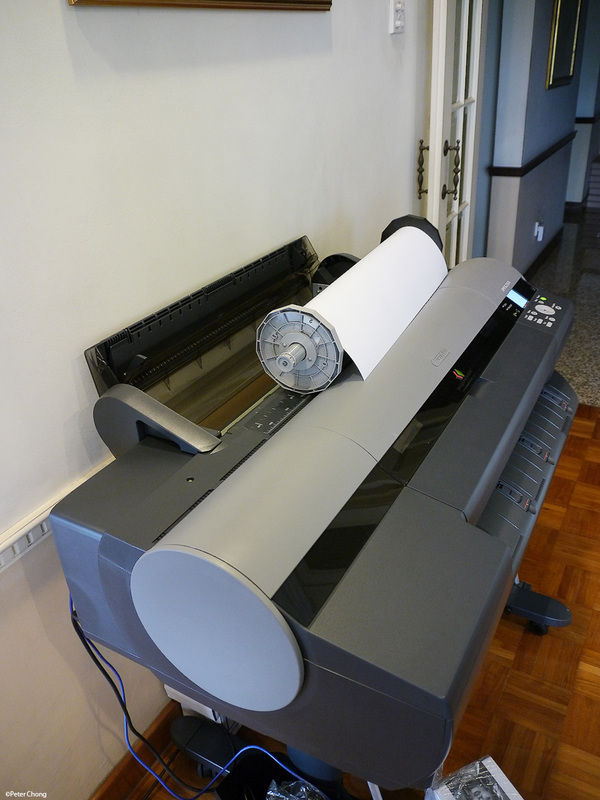 First, open the top of the printer, where the roll paper lives. Remove the roll. Note the roll's ends are colour coded, so you won't insert the paper the wrong way. Remove the ends of the roll holder, and remove the old roll. The roll is then inserted into the spindle, and the spindle assembly returned into the prnter. The spindle is motorised, and detects the paper edge as it is being inserted into the rollers. Automatically fitting itself into the printer. The printer also features a vacuum to hold the paper. 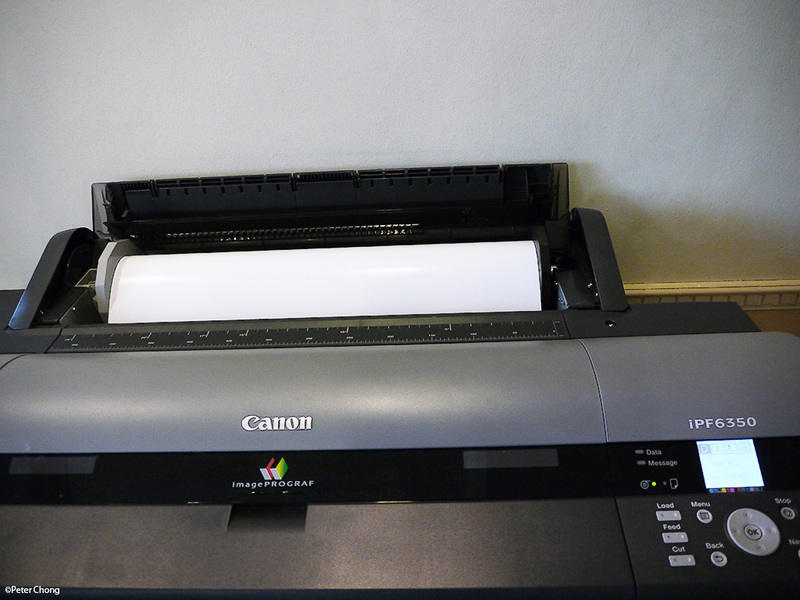 I did not find any signs of the paper edges being damaged by grip rollers, so the 6350 is very gentle with the paper. 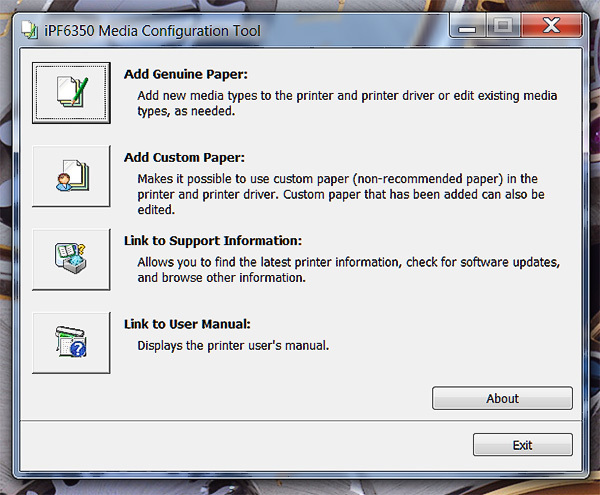 The printer goes into a configuration mode. The red "message" light is on, telling me that some action is needed. 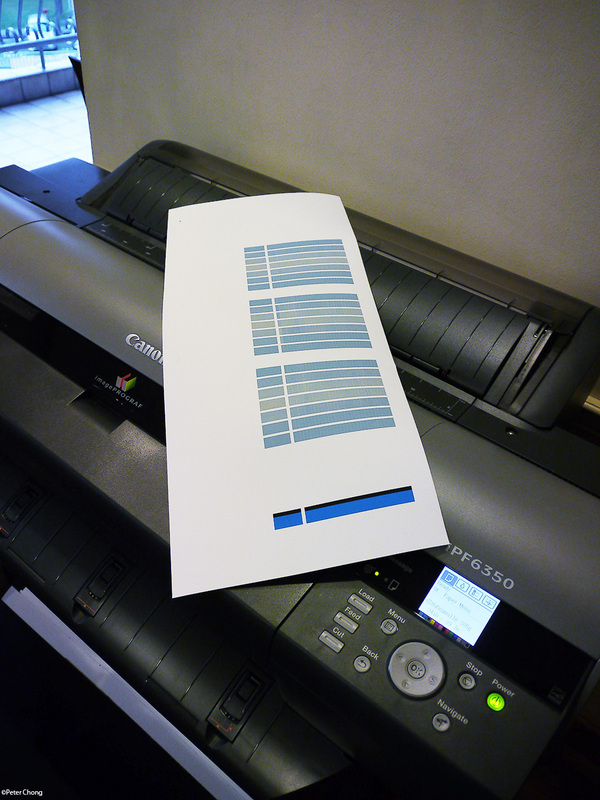 I had to tell the printer what is the new roll of paper I had inserted. Looking through the menu, I did not find the Hanhemulle paper. So I had to configure the printer to accept the physical characteristics of the paper. Off to the Canon site, to download the Media Configuration Tool. 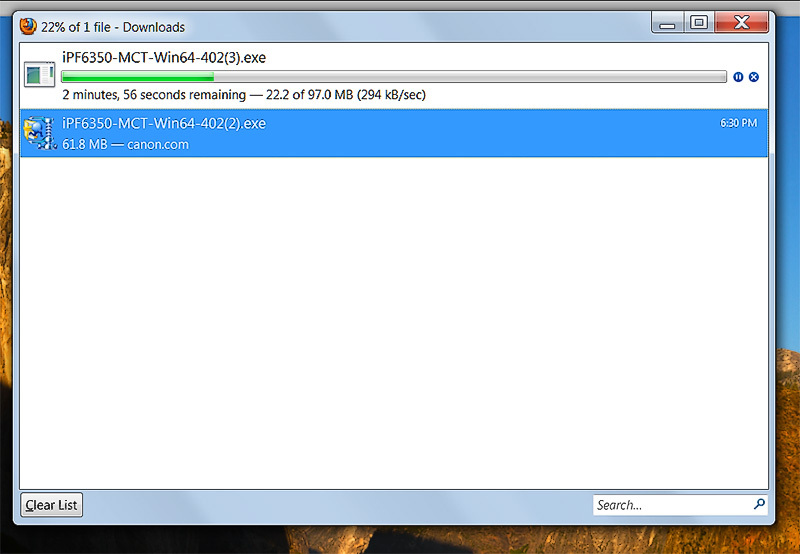 Its just 90-some MB, so its quite a quick download. As this is not a Canon paper, I selected "Add Custom Paper". Check to see the dot gain (this is the spread of ink as it is sprayed on the paper, and how much each dot increases in size as the ink is absorbed by the paper). Everything looks fine, and I committed to the new media. The printer goes into a reload, and when it came back to live, it had already automatically selected the new paper I had configured. I have had my laptop - a Dell Studio XPS 16's display earlier calibrated by the KHL printer folks with their X-Rite Eye One. And I find the display pretty close and useful as a soft proofing tool. I had also earlier downloaded the Hanhemulle paper's ICC profile and installed it on my laptop. So let's do a test print. I loaded the image on Photoshop CS4. 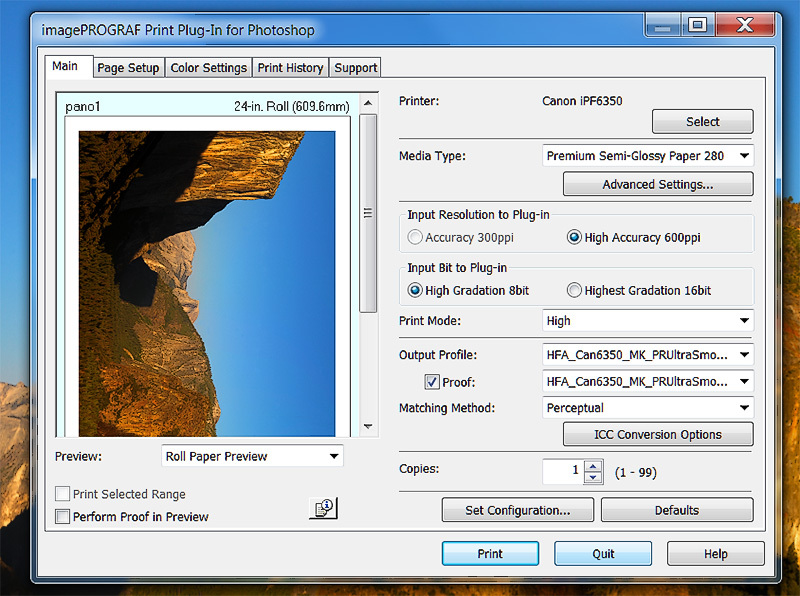 And used the print utility...which is accessed via File/Export/ipF6350 Print Utility. 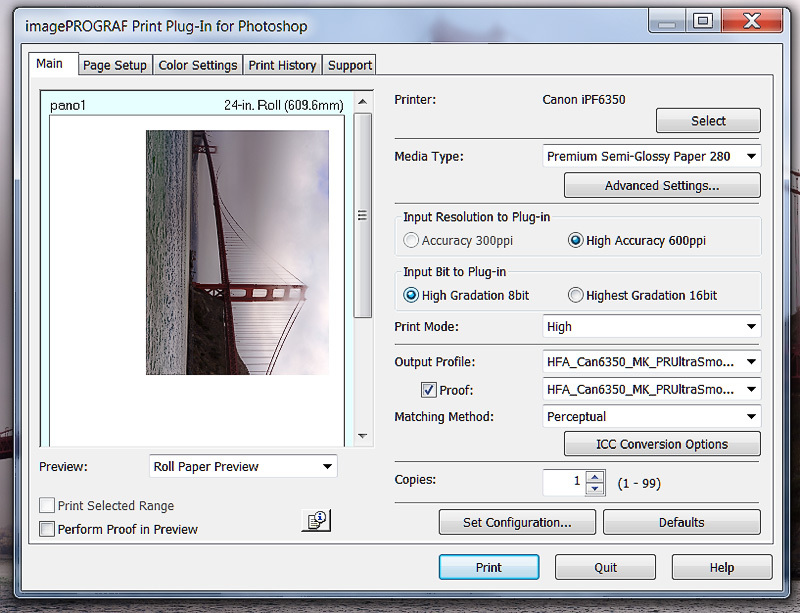 I can also print directly from Photoshop, but found the Canon's Print Utility's interface more friendly. I also found that the ICC profiles are handled very well by the Print Utility, making it not necessary to create a custom ICC profile. At least where the paper manufacturer releases a well made ICC, as is the case for the Ultra Smooth Photo Rag 305. Note the profile used is the ICC I had earlier downloaded for the Hanhemulle paper. I printed this image, and wanted to print another. Note that the above image is landscape in orientation, using the width of the paper - all 24 inches as its height. The image is approximately 1m length. 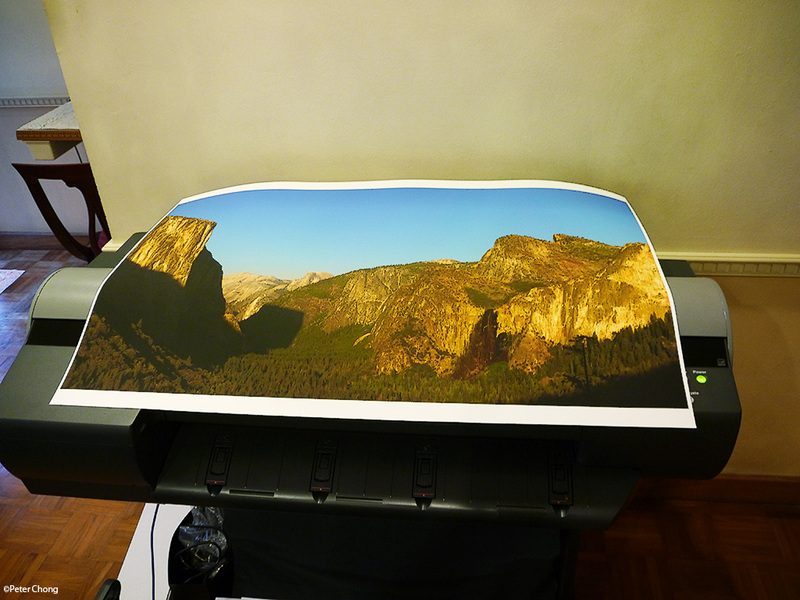 This image from Tunnel View at Yosemite, showing the entire valley during a September sunset was printed in 9 minutes flat. Pretty fast for such a large print. The Hanhemulle Ultra Smooth Photo Rag 305 rendered the image rather bright, which is the original intent of the manufacturer...the white is brilliant. The blacks perhaps needed some adjustment on my side, as I felt perhaps the dark shadows, which I had placed at Zone I in my photo visualization, was not quite deep black. 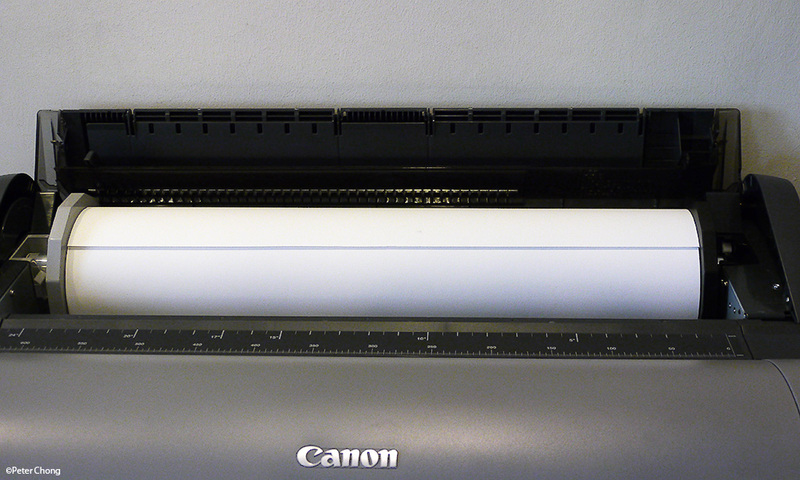 But my next image is portrait orientation...the long side being in line with the width of the printer. I had just to change the orientation in the next tab...and this is fixed. 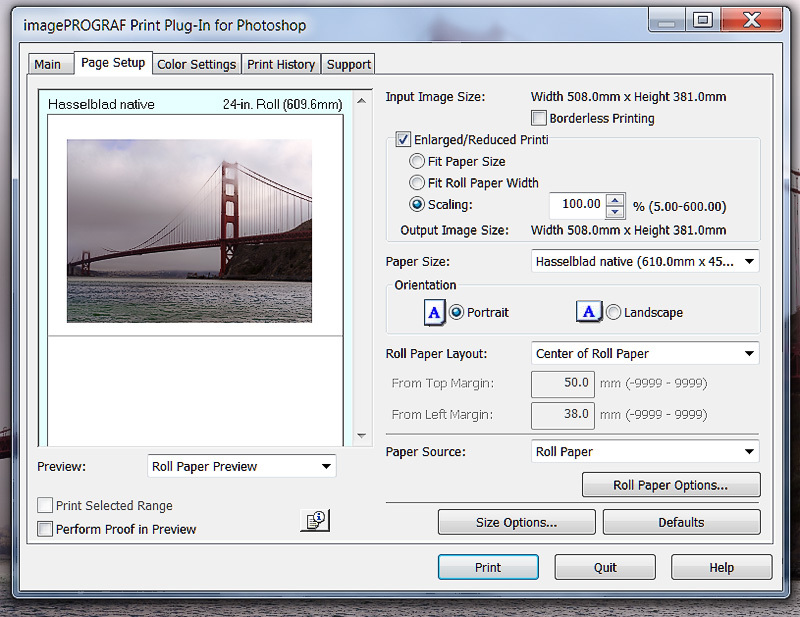 For each image to print properly, I created a seperate custom paper size. I could get the printer to include a border or if I wanted it to print borderless. The ipF6350 has a built in hard disk, some 80MB to store the files. It took a mere 10 seconds to send the file from CS4 to printer via USB2. And after the printer has accepted the file, it could carry on without the computer. I disconnected the USB, and it happily continued to finish the print job. Next installment of this review will cover my impressions on print quality and colour. Greeting from Jakarta. Dear Peter, may I know where did you buy or get the Hahnemuhle paper in Singapore? I would like to buy it too. Bits and Bytes carry them.